The philanthropic landscape is vast, and finding the right charitable fit for a company takes time. From Philadelphia to Phoenix and points in between, the Commvault Hockey Team is lacing up their skates this winter to raise awareness and money for children's organizations. The data-management vendor's Hockey Helping Kids program, now in its 16th season, runs hockey events in NHL arenas across the country. Employees, partners, customers and kids have a chance to skate with former NHL and Olympic players. Raffles and auctions are part of each day-long event, and all proceeds go to designated children’s charities. Getting kids, many of whom have disabilities, on the NHL ice with the other players is one of the most rewarding parts of the program, says Randy DeMeno, chief technologist at Commvault. Playing hockey to help kids works great for Commvault – its program has raised more than $1 million so far. But obviously not every vendor will gravitate to hockey. The philanthropic landscape is vast, and finding the right charitable fit for a company takes time. We heard from tech companies – big and small – that have found ways to launch and develop philanthropic programs. Here are some approaches that work for them. Natural disasters hit close to home for Vertafore, since the software maker’s customers – insurance agents – regularly face crisis situations. That’s one reason Vertafore’s charitable efforts include rapid-response volunteering initiates, such as a lunch delivery drive the company held in the aftermath of the 2014 mudslide in Oso, Washington. Vertafore packed and delivered 100 boxed lunches to disaster relief workers at the site. A number of vendors tap internal expertise and company technology to benefit nonprofit and community organizations. Big data startup Trifacta offered up its technology and office space for a DataDive event put on by DataKind. Trifacta hosted three volunteer teams from local nonprofits – Mission Economic Development Agency, San Francisco Health Improvement Partnership, and TechSoup Global – which used Trifacta’s technology to profile, clean and standardize their respective data stores in order to make better use of the data. "The most rewarding part of the DataDive was applying our skills as data professionals to help address social issues in our very own backyard,” says Jesika Haria, software engineer at Trifacta. 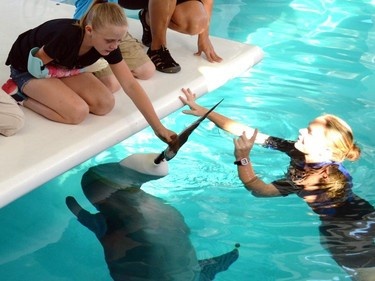 A girl named Annika receives a Stratasys 3D-printed prosthetic on a visit to Clearwater Marine Aquarium. Another example is 3D printing specialist Stratasys, which works with nonprofits such as Magic Arms and Limbitless Solutions to assist in building 3D-printed orthotics. Similarly, Seagate, though its Preserve & Protect program, donates rugged data storage and cloud storage solutions to wildlife conservation groups to help their field teams capture, transport and back-up photos, videos and other data. It’s a natural for tech companies to get involved in corporate social responsibility (CSR) initiatives aimed at STEM education, but not every vendor knows how to get started. kCura aims to give schools access to technology through its Wired to Learn Grant. The e-discovery company selects an under-resourced local school to be the recipient of $250,000 worth of technology and professional development over a three-year period. On top of that, kCura created a playbook for the program so other companies can replicate its success with other schools. The consensus among people we talked to is that CSR projects work best when they’re initiated by employees rather than dictated to them. “We make it very personal as the majority of the programs are driven directly by our associates and then backed by the organization,” says Thomas Gravina, CEO of cloud services company Evolve IP. “For example, if an associate donates to a charity, the company matches it financially. If they are volunteering, we rally around them with volunteers to make a bigger impact. This has had a huge effect on the groups we support as well as our company culture – it’s been very rewarding in just about every way imaginable." At SAP, thousands of employees volunteer at hundreds of nonprofit and charitable organizations across the country during the company’s signature initiative, Month of Service. Key to the program’s success are SAP’s 300 self-selected volunteer ambassadors. These employees donate their time and energy to leading and organizing traditional and skills-based volunteer projects, as well as mentoring students, blogging about experiences, and recruiting other volunteers. Level 3 employees collect sporting equipment for A Precious Child. At the same time, companies have to be realistic about what they can support. Level 3 Communications distributes its corporate grant monies to recipients that generally fall into a few distinct areas, including education, serving the underprivileged, and environmental/sustainability causes. Through its nonprofit foundation, Level 3 supports the same areas plus animal welfare, arts and culture, and health and disease. "Every new initiative or new idea that comes about, you have to make sure that it's going to have value and be meaningful for a broad population, not just for the individual employee who might bring the idea to you,” says Laurinda Pang, EVP and chief administrative officer at Level 3. It’s amazing how big a difference a single, coordinated day of service can make. One day a year for the past eight years, product design company ZURB puts all of its client projects on hold and works 24 hours straight to craft an entire marketing campaign for one lucky nonprofit. The event, called ZURB Wired, gets everyone in the company involved. Over the 24-hour marathon, employees create a new website, t-shirts, posters, postcards, banners, digital campaigns, videos and more. This year, the beneficiary was Downtown Streets Team, a transitional program that prepares homeless members for permanent employment and housing. “It was fantastic to work with such a passionate team and for such a worthy cause. Downtown Streets Team was really engaged throughout the whole 24 hours, and knowing how important this is to them kept us all going strong to the finish,” says John Leenane, a partner at ZURB. The Nerdery does something similar. The software design and development company’s Nerdery Overnight Website Challenge, begun in 2008, provides web design and development services to nonprofits. The Nerdery rallies staff and fellow web pros throughout the community to spend 24 hours – in a row – helping nonprofits create websites, all pro bono. This year, the 24-hour challenge happened simultaneously in Chicago, Kansas City and Minneapolis, where volunteers formed teams to provide everything from front-end and back-end development to project management, UX design and copywriting. “It’s particularly gratifying to use our time and talent to help nonprofits engineer software they couldn’t otherwise afford, and rewarding to see nonprofit organizations move forward with websites that improve their ability to build community, raise funds, organize volunteers and deliver services to the communities they serve,” says Mark Malmberg, communication director at The Nerdery. It doesn’t have to be a marathon, of course; the key is getting something on the calendar. Dimension Data schedules an annual community service day as part of its Heads, Hearts and Hands Program. This year, employees focused on school maintenance projects, including painting, building and other upkeep, at 11 schools around the country. 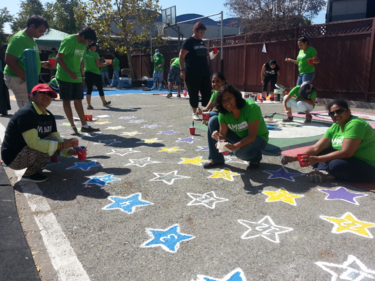 AMD employees in Sunnyvale, Calif., volunteer at InnVision Shelter as part of AMD Cares Global Day of Service. AMD, too, celebrates its AMD Cares Global Day of Service. Employees around the world give back to their communities through company-sponsored volunteer events. This year’s event took place on September 29 and benefitted charities including United Way, Austin Pets Alive, and Lady Bird Johnson Wildflower Center. For its part, NetSuite last month held its first Global Impact Week, which saw NetSuite employees participate in a week-long campaign of giving back in their local communities around the world. Some companies opt to let employees volunteer on their own timetable. VoltDB’s employees are encouraged take one day each quarter, with full pay, to work on their charitable passion. In addition, the company organizes quarterly charitable activities that the entire company can join. Network solutions provider Ciena grants all employees one extra day of paid leave each calendar year so they can perform service for a charity or education-oriented nonprofit organization in their local community. To encourage employees to take part in philanthropic activities, Rackspace gives all of its employees 24 hours of paid time off per year to spend volunteering in whatever capacity they choose. If they want some guidance, employees can volunteer through the managed cloud provider’s Rack Gives Back program, which plans single and group volunteer opportunities. We connected with some tech companies that make volunteering a habit by scheduling monthly or even weekly opportunities for employees to donate their time and talent. Workspace learning specialist Grovo has Fridays for Good. The first Friday afternoon of each month at Grovo is reserved for employees to take paid time away from work and participate in service events around the city. Every Monday at an elementary school in Framingham, Mass., employees from OnProcess Technology bag produce for 50 families so that they can have free vegetables for the week. The initiative is part of the company’s employee-led OnProcess Make a Difference program, which is focused on helping local communities. 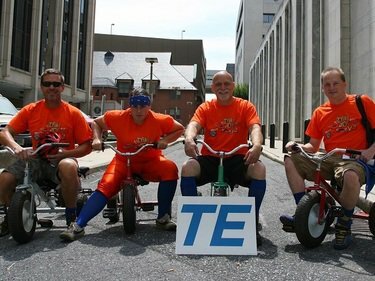 TE Connectivity sponsored an annual tricycle race fundraiser put on by United Way of the Capital Region. TE Connectivity employees race tricycles to benefit United Way of the Capital Region. Before the main even, TE held its own Trike Trials, and the winner went on to represent TE at the UWCR's Trike Drags '14. CSR initiatives can be an opportunity for companies to team up with their customers, too. MakeSpace makes it easy for its customers to donate to Goodwill, for example. The on-demand storage company will drop off donation bags at customer sites (in New York City, Chicago and Washington, D.C.), collect donations, and deliver the goods to local Goodwill facilities. At its annual user conference, Vertafore hosts a Day of Caring that includes customers. Last year, Vertafore employees and customers packed 11,772 pounds of food at Gleaners Food Bank of Indiana. “It was the first year we opened up our volunteer event to customers. For many of our attendees, this was their favorite part of the weekend. It’s something we’re planning to continue every year,” says Anthony Gomes, senior communications manager at Vertafore.